Carla Harryman is a poet and essayist, interdisciplinary performance artist and playwright, and author of twenty genre-crossing books and chapbooks. She is a frequent collaborator whose work has been performed nationally and internationally. In 2012 she and collaborator Jon Raskin released a CD, Open Box, on the Tzadik label. Text-based collaborations include the ten volume series The Grand Piano : An Experiment in Collective Autobiography, San Francisco 1975-1980. She is the recipient of numerous awards including from the Foundation for Contemporary Arts and Opera America Next Stage and serves as a professor of English at Eastern Michigan University and on the faculty of the Milton Avery Graduate School of the Arts at Bard College in New York. She lives in Ypsilanti and Detroit, Michigan. Mirror Play might be described as being sourced in a particular meditation, one focusing on the simultaneity of what is actual in the world and on unreality or de-realization. This is also resonate with a sense of language coming from nothing and from an actual thing, or provocation. The work is also an engagement with listening within a system of word and rhythm that forms itself in time rather than in a pre-existing fully formed concept. From the perspective of the writing subject, the event (or activity) of composition removes one from self-focused content as well as hardened versions of reality. The real and the unreal of Mirror Play are also rooted in war, and particularly the 2003 U.S. invasion of Iraq as an aspect of ongoing war. The collaborative mediation between government and news media of the invasion and the event of war was a fabrication. Mirror Play does not replay the fabricated representations, it makes a word-fabric that stresses temporality and that holds the possibility of destruction and construction in a kind of equilibrium. The clothes flying in the opening represent blown-up bodies alongside a vision that is potentially uninterpretable and ever-changing within the improvised architecture of the text. Performing the work in two languages, something I have done many times, underscores the act of listening in performance, mirroring, but differently, the compositional situation of the writing. The performance itself is a composition, which is non/identical to the poetic-performative text. In this sample of the first pages of the work, I have responded to the recording of the performance with Juliette Delaroque and myself presented in Rouen in 2016. Rather than attempting to duplicate every relation between French and English, some of which was scored and some of which was improvised, I transposed what I heard in the performance into yet another possible version of the work, which to my “ear” suggests a text existing between score and bilingual poem. Certains des vêtements-dans-le-ciel certains battus par des tempêtes ont été mis en lambeaux d’abord dans cette chambre. Qui a commandé le tracteur à chenilles venu aider à traîner le hall d’entrée pour le séparer du reste de la maison. They tied a rope around it after it had been sawed through so that it could be freed from the morbid stuff going on behind it. You want to know how they did it ? You don’t want to know ? 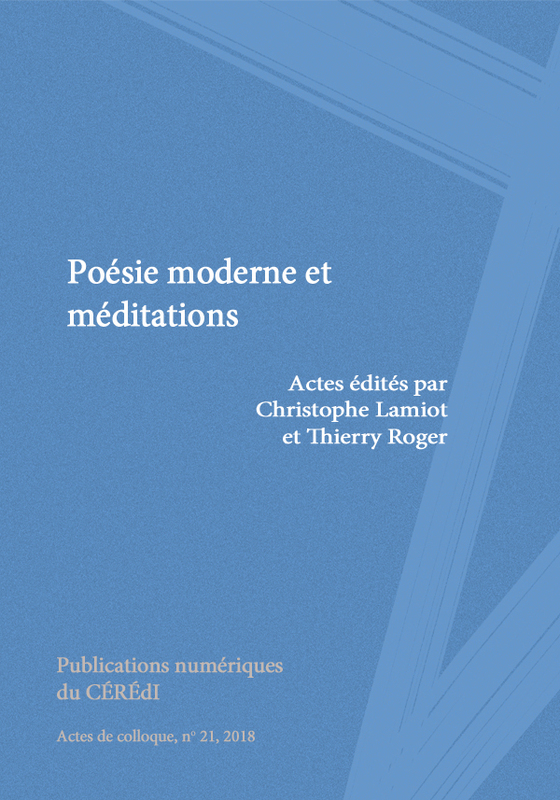 Carla HARRYMAN, « Mirror Play and Meditation » in Poésie moderne et méditations, Actes des journées d’étude organisées à l’Université de Rouen les 21 mars 2017 et 19 mars 2018, publiés par Christophe Lamiot (ÉRIAC) et Thierry Roger (CÉRÉdI).